KARACHI: Zubair Ali, Adil Ali and Mohammad Haseeb are three friends living in the same apartment building behind Cantonment Railway Station. This Muharram they decided to set up a sabeel on the footpath outside their building’s main gate. 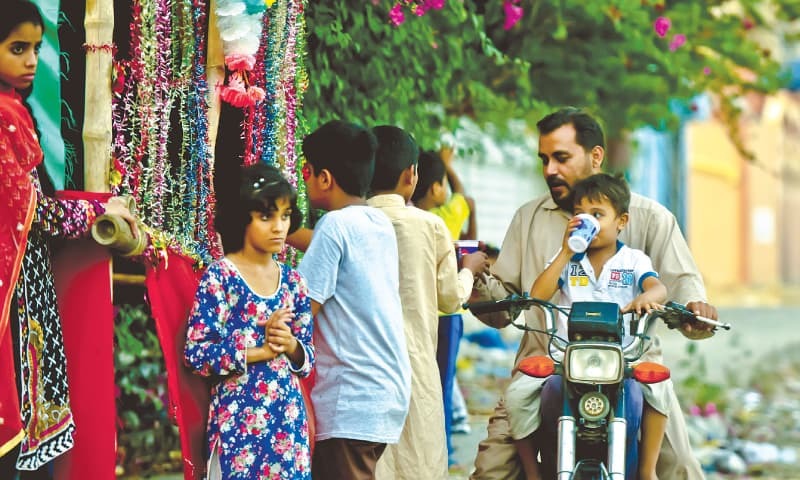 Though not really in the path of the Muharram processions, it is a hit with the children offering cool milk sherbet to passers-by as well as other neighbourhood kids who can’t seem to have enough of the refreshments. The distances covered by Muharram processions would feel even longer than they are and extremely tiring, too, if not for those sabeels or stalls on the sides of the roads where young volunteers offer refreshments to the wayfarers. 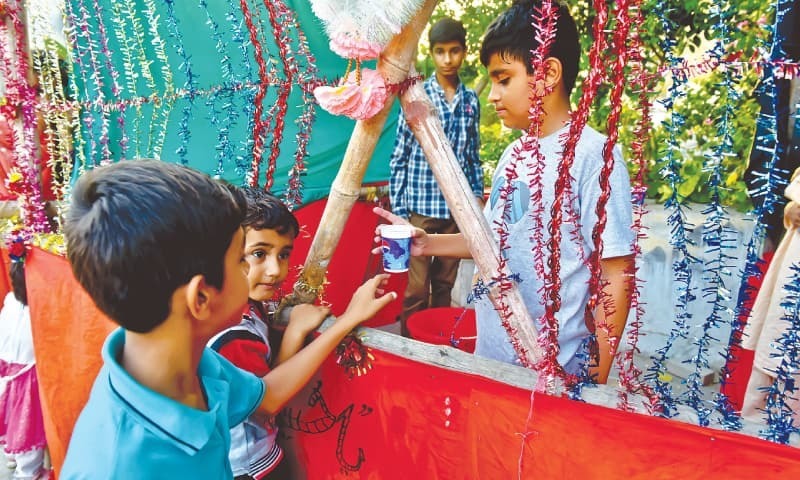 Zubair, Adil and Haseeb’s sabeel has a sturdy bamboo frame joined with rope and covered with green, red and black fabric. It also has strands of paper flowers and shiny decorations tied around it. “We got the bamboo poles from a shop near the bus stop and the fabric to cover our sabeel came from the weekly Tuesday bazaar. 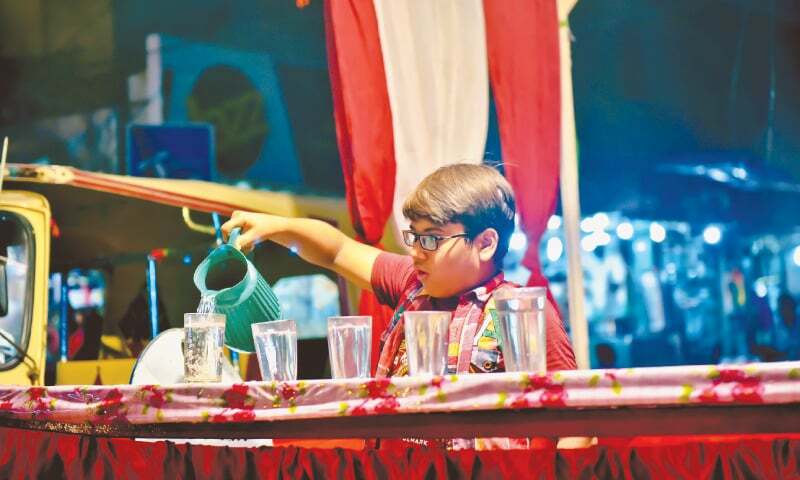 The decorations and plastic glasses we got from the wholesale Paper Market,” Haseeb shares the details with pride. And where did they get the money for it all? “We went around collecting donations from our neighbours. Some donated Rs50, some Rs100 and some even Rs500 or Rs1,000,” says Haseeb. A man and a child on a motorcycle stop for a bit. 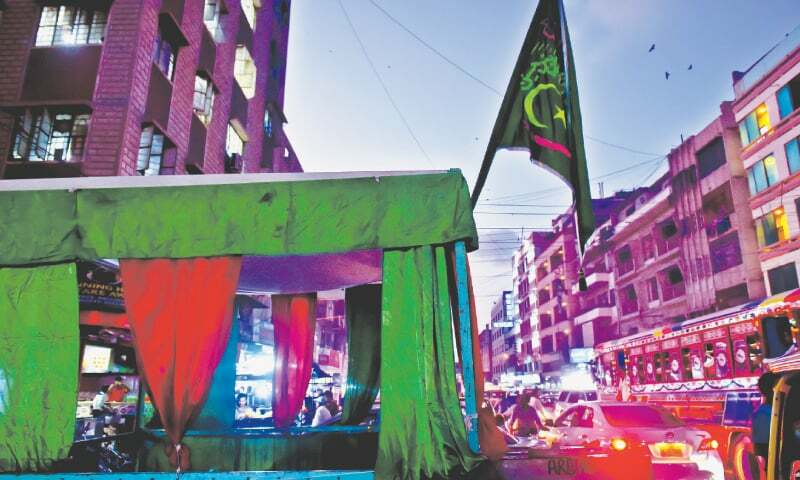 Noticing the three colours of the stall, the man jokes, “Do you belong to the PPP or PTI?” The children laugh and shrug. “I just want to know if you are involved with any political party?” he probes further to which Adil shakes his head. “No, uncle, we don’t belong to any political party,” he says. “And we have no motive other than collecting lots of prayers,” he adds. The man then inquires what they are offering in the plastic disposable glasses. “Is it sherbet or squash or plain water?” he wants to know. “Uncle, it is doodh ka sherbet [sweet drink prepared from milk] with pistachio, almonds and red sherbet added,” replies Zubair, standing near the red bucket and holding a big stainless-steel spoon with which he is pouring the liquid into the glasses, before offering the man two glasses, one for him and one for his little boy. He receives lots of praise and prayers in return. “We get eight litres of milk, pistachio worth Rs300 and almonds for Rs200 every day. And my mother made the sherbet,” explains Zubair. “We have been doing this from the first of Muharram. We come here to serve the drink soon after Asr prayers every day. And when we are out of sherbet, we go play cricket,” he adds. There are also two other sabeels set up in adjoining lanes of the area, says Qurban Ali, a neighbourhood elder. “You also need to know that this is a predominantly Sunni area. We are all Muslims to start with and the tradition of setting up sabeels is for the assistance of our Shia brothers who are busy holding majalis and listening to the tragedy of Karbala at this time of year,” he explains. The sabeels are set up in remembrance of the thirst of the Prophet’s grandson, his family and followers who were denied access to water, a basic human need, and martyred by imperialist forces of the time during the holy month of Muharram. 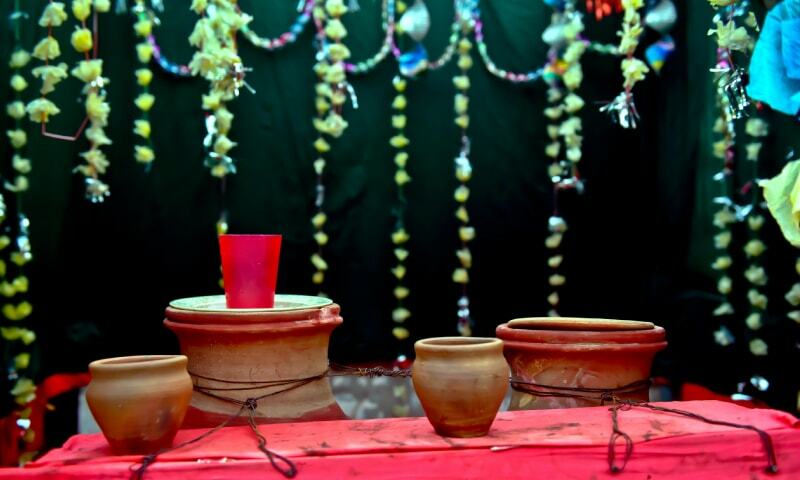 “I remember when I was a child, we would always set up a sabeel outside our house. And not just us, they would be popping up everywhere like little springs in the desert,” he says, adding that it’s unfortunate that a sectarian wedge was driven deep into society in order to take the young ones away from this sweet tradition that keeps the thirst of Prophet’s family fresh in their minds and teaches them not to bow before evil forces while helping others.